Facowie (pronounced Fa-cow-wee, named after a lost Indian Tribe) Lodge is a wilderness retreat is located just Northwest of Buyck right off the main thoroughfare of Crane Lake Road approximately 5 miles before the town of Crane Lake. This two-unit home (this unit Loon Lodge, VRBO listing 4544341and the other unit Grand Lodge, VRBO listing 4553868, can be rented separate or combined for a larger group) is beautifully situated over a small tranquil lake called Kabustasa right across from Echo Lake. It is a very peaceful setting without all of the hustle and bustle of a large resort. The lodge is set up for accommodations for the outdoor enthusiast, family vacations or business retreats. 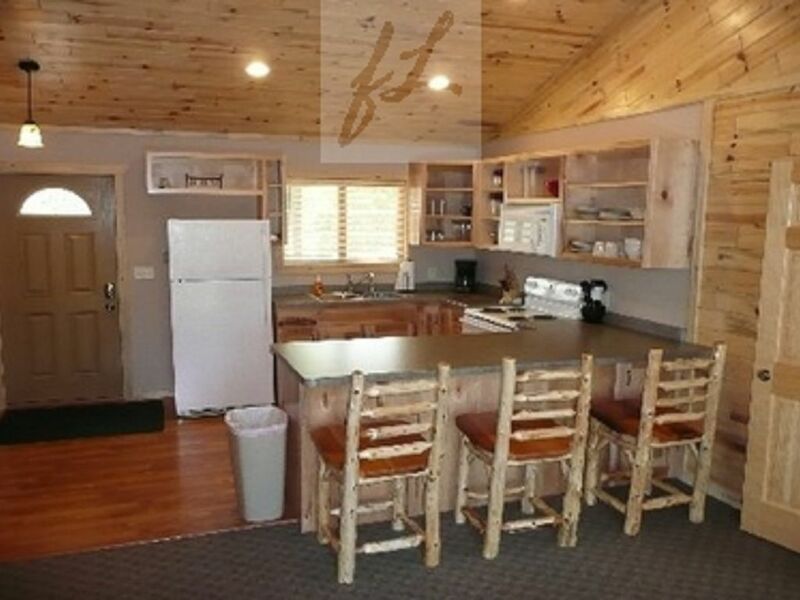 Both lodges are set up as two bedroom units with one having a larger living area. They are both tastefully decorated in a Northern Minnesota style and nicely furnished with an "up north" theme. They can each easily accommodate up to 4-7 people and an adjoining door can be opened up to accommodate larger groups. The lodge is angled so that is has a full view of the small picturesque lake and has some gorgeous sunsets to the west across the lake. The area is filled with many outdoor adventures and activities to do. There are many types of adventures that can be found in the area, including hiking, site seeing, boating, blueberry picking, bird watching, wildlife sightings, hunting, fishing, snowmobiling, 4 wheeling and the list goes on! Google Earth is a great program that allows you to zoom from the sky to have a bird's eye view of Kabustassa Lake and see the beautiful area surrounding Facowie Lodge. This is a free download software package that allows you to the terrain and all of the lakes. Our Lodge is located right off of a paved highway so it is easily to locate and very accessible. I have been enjoying the Crane Lake area since I was first introduced to it by in 1977 with my first deer hunt. I have since learned all of the beautiful outdoor benefits that this area has to offer including boating, hiking, fishing, snowmobiling, ATV'ing, hunting and list goes on.... I developed the concept of a rental lodge during a stay in the area and purchased the land in December of 1995. My background is in Property Management (own and manage apartment buildings all over MN) so I created a premier rental that I could manage from where ever my location. It is set up for outdoor enthusiasts, family vacationers or business retreats. Facowie (pronounced Fa-cow-wee, named after a lost Indian Tribe) Lodge is a wilderness retreat is located just Northwest of Buyck right off the main thoroughfare of Crane Lake Road approximately 5 miles before the town of Crane Lake. This two-unit home is beautifully situated over a small tranquil lake called Kabustasa right across from Echo Lake. It is a very peaceful setting without all of the hustle and bustle of a large resort. The lodge is set up for accommodations for the outdoor enthusiast, family vacations or business retreats. Facowie Lodge is nestled in one of Minnesota's most beautiful areas that have an abundance of activities within a 10-mile radius. These activities would include: Fishing﻿ - There is an Abundance of GREAT Fishing Lakes Nearby Canoeing - Miles of rivers for canoeing (many different classes of rapids) Hunting - Thousands of Acres of Public Hunting Land, Snowmobiling - Hundreds of Beautifully Groomed Trails (one of the main trails crosses Facowie Lodge property), Hiking - Many Trails that Lead you to Spectacular Falls & Gorges Beaches - There is a Beautiful Public Beach 1 mile from the Lodge. It has a Picnic Area, Playground and Boat Launch (Echo Lake) Many, Many more Activities! We have provided information on this website so the outdoor enthusiast has the opportunity to enjoy the benefits of this beautiful area. The concept behind Facowie Lodge is to provide reasonably priced Northern Woods accommodations for responsible parties. The lodge is set-up Dish Satellite TV and wireless internet for entertainment or just for the rainy days. The Lodge is set up, ready to use and has easy instruction (just in case the Lodge Master is not up there). A Picturesque View looking down a Steep Hill over looking Kabustasa Lake which is a 190 acre Lake. There are Beautiful Sunsets every Night Across the Lake. There is not an Air Conditioning Unit in the Lodge. The Structure is very well built and insulated well. The entire basement is about 20 degrees cooler and the cool air radiates up into the unit. Fully stocked kitchen with most common dishes, utensils & cookware. A Large 74' Deck in Front of the Lodge Shared by both Guests. Has a Bump Out Area w/ a High Top Table and 4 Chairs to sit out & Enjoy the View over Lake Kabustassa! Beautiful Sunsets Every Night! A 17' Coleman Canoe is available with Advance Notice. We really enjoyed our stay at Facowie lodge for snowmobiling. Practically right on the trails for easy access and minutes away from gas and food. The lodge was clean well decorated and plenty of parking space for big snow trailers and trucks. Gas fire place was operational and provided warmth at night after a day of riding. I would highly recommend this place to stay if you want to see the beautiful Voyeger National Park up close and personal and surrounding areas. We appreciated your stay at FacowieLodge and thank you for the great write up! The Voyageurs Nation Park and Crane Lake area has some of the best snowmobiling in Minnesota and I'm glad that you were able to enjoy it. It's a little drive but the pay off is amazing with the trails, scenery and the business establishments to stop at! We enjoyed the Facowie Lodge. It was well equipped in the kitchen and bedrooms. It was a comfortable stay other than the -10 to -40 degree temperatures. We stayed warm inside. Even with the cold there was plenty of activities in the area. Beautiful and clean, close to outdoor adventures without losing the secluded appeal. Loved it! Our family loved our time at the Look Lodge! Spacious, great view on the lake, warmly decorated. Friendly host, quiet environment, comfortable, and well furnished. We enjoyed our stay at Facowie and thought Dave was very helpful in getting information to access the lodge as well as activities available in the area to us. We visited the Orr visors center. Walked the big walk, visited the Vincent Schrute Bear Sanctuary, explored vermillion falls and rented a boat from Hanburgs per the recommendation binder. Had a great time and would love to return. Hoping in the future dock access and ATV rental will be available for renters. I would highly recommend this unit for anyone wanting to explore the area or even just relax. Upon request on a booking, we have a 4 page Guest Information packet that has lists of all the activities in the area.